Vertical ridges in fingernails: causes, aging & health related variations! VERTICAL RIDGES IN FINGERNAILS: CAUSES, AGING & HEALTH VARIATIONS! Vertical ridges in fingernails concern usually a harmless issue, because eventually as we grow older everybody develops a few vertical ridges. Vertical nail ridges origin from the anatomy of the nail appartus (contrary to 'horizontal ridges' - which have a strong connection with physical trauma & disease). However, sometimes the vertical ridges can become unusually pronounced featured with irregularities, and especially when other nail abnormalities get noticed as well then the unusual vertical nail ridge variants can signal (life threatning) health problems! The article below explains why fingernails in most people are featured with smooth shaped vertical ridges that become more pronounced due to aging. And additionally some specific guidelines are presented in order to discriminate normal vertical nail ridges from the pathological variants. Re: Vertical ridges in fingernails: causes, aging & health related variations! Interesting article Martijn. I have a few questions. where did you get the pictures? are you sure they are healthy? eg especially the colouration of the nail in number 2. Also the apparent horizontal 'flatness' of the lower third left side of the nail on number 1 (or maybe that is a trick of the light). again, same question - are you sure the photos are from healthy elderly people? eg number one looks quite pale, number 3 looks quite red and has some beading. regarding the comment "as we grow older everybody develops a few vertical ridges." do you know from what age they become more common? not all elderly people have them, and many younger people do have them! I agree with Lynn. Only the top right nail looks healthy and normal of the healthy group. I have the same questions Lynn has. Lynn wrote: Interesting article Martijn. I have a few questions. Regarding your first 2 questions: regarding the 3 examples of vertical nail ridges in elderly the sources have mentioned explicit that the individuals have no health problems. Regarding the first 3 examples I have no explicit info for confirmation. Regarding your final question, I think there are no specific ages involved in these processes. Yes, you can sometimes even seen the vertical ridges in children - but in many cases it may require sharp eyesight! 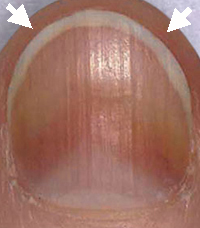 The middle 'healthy' nail may have healthy vertical ridges, but usually when there is such a deep redness under the nail there is inflammation in the body. Patti wrote: The middle 'healthy' nail may have healthy vertical ridges, but usually when there is such a deep redness under the nail there is inflammation in the body. Patti, thanks for sharing your thoughts & having the same questions about this. Martijn - agree that there could be problems with light source, skin tone etc. Regarding number 2 of 'healthy' nails, no matter how hard I press my thumb I cannot replicate that 'bruised' appearance (which suggests maybe circulatory problems? or as Patti said 'some inflammation'?) and I don't see any likewise redness in the distal nail fold (?). I'm glad that you understand my worries Martijn. Regarding the medical website which explicitely reported that there were no health issues involved in the individual - if we're talking elderly, they usually have some health problem or some stress?? Hence my question about how old are we talking here? And I'd like to see the rest of the hand/palm. The nails don't seem healthy to me, but then it depends on how one defines health. Lynn wrote: Patti, thanks for sharing your thoughts & having the same questions about this. I disagree that 'elderly' should usually have health issues (which appears to be your suggestion); for example: elderly can be described as 'healthy' when the health issues that they had - during let's say the past 10 years - concerned temporary health issues only (for example: both of my parents would fit this description). zaobhand wrote: The nails don't seem healthy to me, but then it depends on how one defines health. Martijn (admin) wrote: I disagree that 'elderly' should usually have health issues (which appears to be your suggestion); for example: elderly can be described as 'healthy' when the health issues that they had - during let's say the past 10 years - concerned temporary health issues only (for example: both of my parents would fit this description). Age is relative. See for example the "Blue Zones" - cultures with high percentage of centenarians. They have 1/6 the rate of cancer, heart disease etc. They mostly die peacefully in their sleep. They have no concept of retirement. They probably become elder much later than the average reported in this link. zaobhand wrote: Age is relative. See for example the "Blue Zones" - cultures with high percentage of centenarians. They have 1/6 the rate of cancer, heart disease etc. They mostly die peacefully in their sleep. They have no concept of retirement. They probably become elder much later than the average reported in this link. Well yes Boaz... everything is indeed relative to everything. Therefore I hope my examples will serve as a valuable tool to discriminate 'irregular vertical ridges' resulting from the process of aging from the 'irregular vertical ridges' caused by medical problems. And after all, only the first 3 examples can be described as presenting 'normal vertical ridges'! PS. I think it might be interesting to become aware that the responses so far did not focus very much on the RIDGES seen in the photos... and I think this could indicate that the 9 examples serve actually very well for the purpose that I had in mind. Focusing on other aspects in the photos could become confusing - especially when one does not consider those other characteristics in the perspective of the manifestation shape of the vertical ridges... because the photos were taken in different environments -including: varying backgrounds, different cameras, different light lightsources, but one should also not forget to consider ethnicity, age etc. So again, everything is relative to everything... therefore one should not forget to focus especially on the ridges: then the essential differences should become obvious and one should become aware that it is not always easy to discriminate nail disorders due to age from nail disorders due to disease, etc. The first 3 nails don't lend an impression of "healthy individuals"... perhaps individuals with currently non-life threatening conditions. zaobhand wrote: The first 3 nails don't lend an impression of "healthy individuals"... perhaps individuals with currently non-life threatening conditions. Sorry Boaz, I have to point out once again that your statement is not specified at all. (I am not sure which nails you have in mind, but I assume that you are talking about the first 3 examples in my article?). Your words sound to me like you are not aware at all that minor nail abnormalities (such as for example the partly flat surface seen in the first 'healthy' example) are actually very commonly seen in healthy individuals. Boaz, maybe you can describe what it takes according your perspective to recognize a 'healthy individual' through the observation of just one single nail? Martijn, Please disregard my comments then. It is not really important for me to make a point. Thanks for your informative article. Perhaps some distinction should be made between the health of an individual, as seen in the nails, versus health of the nail. For instance, in the second group of "healthy" nails, there is a nail that splits at the end in the center and this split is obviously proceeded by a beaded appearance. (to use Lynn's terminology) This situation is described in The Growing Hand and in order to determine the cause of the split, the nail must be removed and the nail bed examined for scarring. "A scar in the germinal matrix prevents the normal flow of cells into the nail plate. This causes normal production to occur only along the sides of the nail plate, resulting in nail splitting." Perhaps the person is in good health but the nail is not. In the top row of nails where we are questioning the nail with the yellowed and reddened tones under the nail, the nail may be healthy but unless they hit this nail with a hammer in the recent past, I'd say they are dealing with some kind of health issue. zaobhand wrote: Martijn, Please disregard my comments then. It is not really important for me to make a point. Thanks for your informative article. Alright, no problem: thank you for your comments.